Current advanced HMIs have built-in controllers that can handle tasks that once required a stand-alone PLC. An all-in-one HMI+controller combines the HMI and PLC functions into an integrated piece of hardware and a unified software development environment. This means that separate HMI and logic development tools or mapping between disparate databases are not required. An all-in-one controller is a single piece of hardware. The integrated HMI+controller includes the controller/CPU, digital and analogue I/O signal processing, network communications and touchscreen display in a single hardware platform. This type of configuration typically saves panel space and both wiring and programming time. The typical HMI+controller has a fixed amount of I/O built in. A common configuration is 20 digital inputs and 14 outputs. Smaller digital I/O counts are found on units that include built-in analogue I/O. A typical analogue unit includes four analogue inputs and two analogue outputs, with current, voltage and temperature signal types. Many of these systems also have a built-in CANopen master port, or similar, intended to scan remote I/O if needed. A variety of CANopen compatible remote I/O can be used for expansion, and a wide range of I/O types is available. Some all-in-one units have no limit for remote I/O other than the number of drops the network allows. However, the real limit is when performance starts to degrade – too many I/O and the unit can become overwhelmed, hence all-in-one units really fit best in small to medium-small applications. Some HMI+controllers include two or four axes of basic motion control functionality suitable for controlling stepper motors. With high speed counter inputs, encoders can be added and pulse-width modulated. Or, pulse and direction outputs can digitally control the stepper drive. These all-in-ones are more than capable of controlling OEM equipment and custom machines and process. If data collection is needed, and the HMI and PLC are separate system elements, where should the data collection be done? Where is it easier? It could be either. But with the all-in-one approach, data collection is done in the tightly integrated environment and can be seamlessly programmed along with the control logic and HMI functionality. 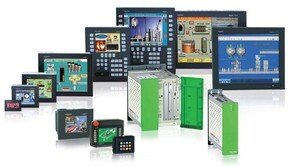 All-in-one systems work well in systems where a small stand-alone HMI and a small to medium-size micro ("brick") PLC might otherwise be specified. Applications for HMI+controllers are very varied: the all-in-one is suitable for use in any machine application that would work with a separate small PLC and small HMI. Some good application examples include OEM baggers, shrink wrappers, motor speed control, feeders, labelling and inspection machines. Typical I/O counts for these applications are 16 to 32 inputs and outputs. With the above limitations noted, all-in-one systems can be and often are used on fairly complex machines with remote I/O and motion control requirements. 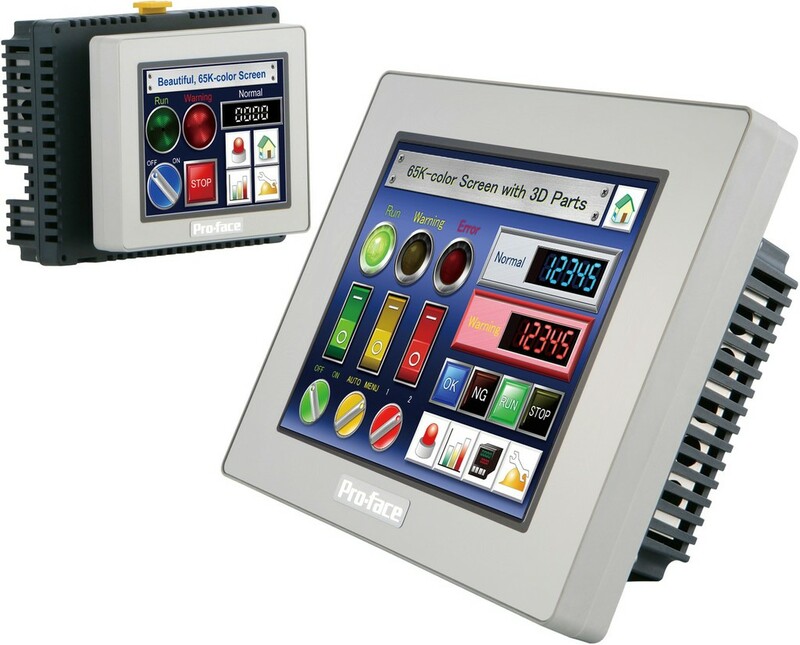 They also interface well with other PLCs and HMIs as part of even larger systems. * The Japanese-founded Pro-face originally gained global recognition as a specialist in HMI (Human Machine Interface for Operator Terminals) and IPC (Industrial Personal Computers). In 2016, the company was renamed Pro-face by Schneider Electric, a company with which it first entered a "capital tie-up" in 2003.